And hop ! Another 5 stars hotel on the top of the 3 Vallées resort. Its motto is “luxury is space”. And space, there is here through the 42 rooms and suites from 36 to 70 m2 and the 8 “Cosy Home » translate by super suites from 1 to 3 bedrooms, from 60 to 155 m2 in which there is an american kitchen, a cozy living room to feel at home and live at your own pace… The Pashmina also offers 2 triplex cabin apartments (3 bedrooms) in a real mountain cabin connected to the hotel, enjoying a private entrance and an exceptional view. Two restaurants and a fabulous spa of 400 m2 with hammam, sauna, pool and jacuzzi, by L’Occitane are to be added to the credit of this very successful place. On top of that? the “Igloo-Pod”, a heated and equipped geodesic dome, opened to the sky, where you can sleep under the stars, but comfortably! And of course the hotel has direct access to the slopes. 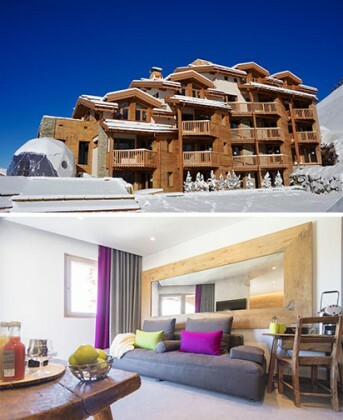 Fourth five-stars hotel of Val Thorens, the Pashmina complets the high-end positioning of the ski resort. A. F.-M.
Hong Kong: Welcome to the Beefbar!